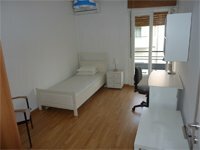 Clutter and organisation in Feng Shui is so important in every building especially an important room like a bedroom as in Feng Shui, the bedroom is considered the most important room as this is where you sleep and your body and mind repair itself and if the energy (qi) is hindered you will not function 100%. When you think about it logically, clutter is a severe interruption to the flow of qi. Clutter can either cause, or be caused by low, or stagnant, qi energy. Negative qi will affect your moods, health and sense of well-being. The effects will be cumulative over time and the reason why you now have TV programs dedicated to people all over the world that live in chaos and clutter and of course this affects the mind and body and also the progress in the your life, it cause blockages in all aspects of your life. 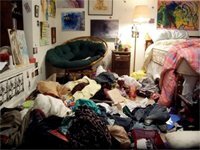 A cluttered master bedroom can cause relationship problems combined with potential health issues. Why not spend the weekend clearing all your clutter from your bedroom and other important rooms in the home, you would be amazed how you will feel and also motivated to clear the rest of the home, believe me it really works and it is that simple; no Buddha’s needed, no candles, no crystals, you don’t have to have to paint the room bright red and will not have to look like a Chinese restaurant. Of course Feng Shui Cures and Enhancers all help but it’s always best to start at the basics and then see what Cures you need to enhance and cure areas. 1) Start with your wardrobes and donate all those old clothes and shoes that have not seen the light of day for many years and take them down to your local charity shop. 2) Move the bed from its current lactation and vacuum and clean underneath. 3) Wash all walls, tops of cupboards, windows and frames. 4) Wash all bedding, curtains and other fabrics that you feel needed cleaning. 5) Make sure ALL shoes/boots are stored away and NOT on display in the room, in Feng Shui shoes/boots are conserved the most dirty item of clothing and regardless if a bedroom or not they must always be stored away to trap the negative qi they bring. 6) Consider changing your bed or at least the mattress, they say you should replace your bed every 7-10 years and to me this is so obvious. I know there will be someone reading this saying that my expensive Vispring bed is still as good as the day I bought it, this may be the case but if it is over 5-7 years old it must be full of millions of dust mites, lice and dead skin so at least get it professionally cleaned. 7) Make sure you have nothing negative stored in the bedroom like old divorce papers or anything else that is considered negative. 8) If you have to have under bed storage draws try and place items like clothing or spare bedroom, duvets etc in them. 9) Avoid having a computer in the bedroom, I know this may be easier said than done but you should mix energies in a bedroom. 10) Personally if I was moving into a new bedroom or just got out of a relationship I would completely refurbish the room with new wall colours and give the room an inviting or romantic feel. 11) If you are in a relationship make sure you have photos of you and your partner and place them in the southeast of the bedroom if possible or better still use our Feng Shui software to find out your true relationships areas in the bedroom and the whole home. Lastly you should space-clear the room, you do can this with a smudge stick like sage or a singing bowl or just walk around the room clapping your hands as loud as possible, this will help remove and move on stagnant qi (shar qi) and encourage new qi to enter. I think both rooms have bad Fengshui but room A is definitely worse of the two. Those colours and colour scheme are not conducive to sleep or rest. More like party time.